Soft baked biscuits made with wholegrain cereals and cranberries and added vitamins and minerals. New from Belvita: delicious & chewy soft bakes. At belVita, we're passionate about breakfast biscuits. That's why we worked in harmony with our farming partners to source 5 of the finest wholegrains. Baked together through our gentle baking process, these selected and nutritious grains are transformed to become tasty soft bakes with proven slow release carbohydrate, as part of a balanced breakfast. 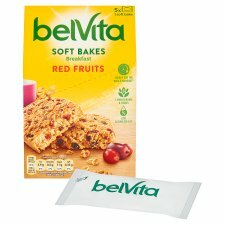 2belVita Soft Bakes have a high content of slowly digestible starch, which is a slow release carbohydrate. 1belVita Soft Bakes with proven slow release carbohydrate, as part of a balanced breakfast.